THIS GIVEAWAY IS OFFICIALLY CLOSED. WE ARE NOT ACCEPTING NEW ENTRIES AT THIS TIME. OUR WINNER HAS BEEN NOTIFIED. AND HAS 48 HOURS TO CONFIRM. ONCE WINNER HAS CONFIRMED, THEIR USER NAME WILL BE POSTED HERE AND ON THE HOME PAGE. THANKS TO EMILY ELIZABETH FOR SPONSORING THIS GREAT GIVEAWAY. AND THANK YOU READERS, THIS HAS BEEN A TREMENDOUS RESPONSE! STAY TUNED FOR A NEW FEATURE AND GIVEAWAY COMING SOON AND DON'T FORGET TO ENTER FOR THE TRES SLEEK SHAPEWEAR BEFORE IT EXPIRES! ENTER HERE! We promised you this would be an amazing week at Ascending Butterfly! We have a summer of surprises in store for you dear readers! Not only do we offer you daily inspiration, the greatest deals on the web and an introduction to the best of the best both online and off, but we also get the chance to share these great finds with YOU. How cool is that? Just when I thought today was going to be another rainy day in the city, the mail offered up quite a surprise! What do the words 'Modern. Feminine. Classic.' make you think of? (Aside from me silly! LOL) It makes me think of today's woman: a constantly evolving mix of what has always worked partnered with what is very 'now'. Today it is my absolute pleasure to introduce you to the Butterfly Kisses Lariat by Emily Elizabeth Jewelry! It arrives in a shiny black box with the Emily Elizabeth logo and inside includes both a polishing cloth and shine/buff cloth, makes a beautiful gift! It's graceful, and delicate but certainly turns heads! Giveaway Time: One lucky Ascending Butterfly reader will win a Butterfly Kisses Lariat by Emily Elizabeth Jewelry! All you have to do in order to be qualified for a chance to win is to visit emilyelizabethjewelry.com and leave a comment telling us what other piece other than the Lariat and the Butterfly Duo Necklace you like, AND you must also follow this blog to enter! They don’t say ‘membership (or in this case, readership, has it’s privileges for nothing!) This is also open to the boys, just tell us what other jewelry item you'd get aside from the two referenced above and who you'd get it for! Please follow directions or you will be disqualified! All comments are moderated, so no worries if your comment doesn't appear on the site right away. This giveaway is open to bloggers and non-bloggers alike, but you must follow this blog for your entry to count. You have from now until Thursday, July 30, 2009 at 11:59 PM (EST) to comment and be entered for a chance to win. Winner will be announced shortly after Wednesday, August 5th! Giveaway open to USA only. Tweet about this giveaway and leave the URL in a comment - you can just cut and paste the following into twitter "OK to RT: Enter to win the Emily Elizabeth Jewelry Giveaway at Ascending Butterfly today - http://tiny.cc/1OOkG"
I really like the I Heart Mother Earth lariate. It's simple, but definately says something. I like the Three Essentials Necklace Trio. And I follow your blog. I follow Emily Elizabeth Jewelry on twitter. I love the Venus Headband. I also follow your blog. I follow Emily Elizabeth Jewelry on Twitter (taterbugtx). 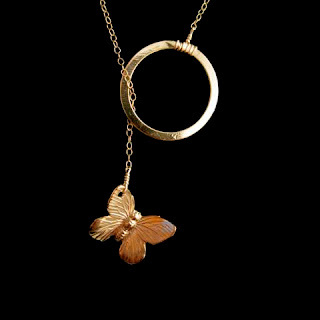 I love butterflies so the other item I love is the Butterfly Duo Necklace. And I'm a follower! I really like the Springtime Dangles Earrings, they are very pretty. Thanks so much for such a wonderful giveaway! Following Emily Elizabeth Jewelry on Twitter (furygirl3132). I like the Fern Leaf Bangle. I love the Venus Headband. Thanks for the chance. I -heart- the adjustable fern leaf bangle- very classy and elegant and timeless. I love the Venus headband! Thank you! It would be one's "good fortune" to wear a "Good Fortune"Cookie necklace, to bring a zing and smile when I go to a Chinese restaurant or just to wear for fun! The good fortune cookie necklace would be unique. Thanks! I love the Hearts Galore necklace the best. I also love the Wreath Earrings. Thanks for letting me enter. I like Ariel's little Friends Necklace. I'm a follower :).Thanks for such a nice blog. I love the Sweet Swoozie necklace - we have a cat named Siouxie!! Hi there. The "Fern Leaf Bangle" is very cool. My girlfriend would flip for that. I'm also following this blog on Blogger. I voted for Tracy at Friends of Elsie....GOOD LUCK! I'm following via google! This necklace is absolutely gorgeous, I also love the Colin Necklace! Thanks for the giveaway! I like the Lucky Clover Lariat. tennrose Enter to win the Emily Elizabeth Jewelry Giveaway at Ascending Butterfly today - http://tiny.cc/1OOkG"
I am fallowing u on twitter too. The Heartsong Bracelet is Beautiful. Christina - xristya@rock.com - I like the Venus Headband! Christina - xristya@rock.com - I also like the Heartsong Bracelet! I love the Saltine Necklace. It's so unique. I also really like the Shooting Stars Lariat because of my blog's same name. i'm following emily elizabeth jewelry. I love the Springtime Dangles earrings and I am following your blog. I like the Astrology Necklace and I am a new follower. I am now following your blog :) and i also love the Under Lock and Key Lariat! I'm following your blog & I love the Butterfly Duo Necklace. I love the Venus Headband. I like the Kimberly Hair Comb. Thank you. I think the Emily Elizabeth Jewelry designs are gorgeous! So many lovely pieces to browse through and at the top of my favorite list is the Fern Leaf Bangle, I think it is very Grecian inspired and just stunning! I love jewelry that has an nature theme to it, and this bracelet really caught my eye! Thanks so much for the chance to enter. I am following your blog as well!! Gorgeous jewelry! I love the Ariel's Little Friends necklace! I'm following Emily Elizabeth Jewelry on Twitter user lisalmg. I'm also following @Tracy_Iglesias on Twitter user lisalmg! My favourite is the Heartsong bracelet, it's absolutely beautiful! The brass charms look fantastic and I bet it sounds amazing when it's worn! The Paper Cut Flower Earrings are stunning! I am following you on twitter, twitter id lunaj1456. I really like the I Heart Mother Earth lariate! Thanks for the chance! The Paper Cut Flower Earrings are gorgeous! I am following Emily Elizabeth on Twitter. I follow you, and I love the Heartsong Bracelet. It is very pretty. Thank you for having this giveaway. I follow you on twitter as litefoot873. I voted, and I was vote number 45. I absolutely love the Venus Headband. Followed! I like the five times guilded necklace! Colin Necklace A has 3 Gold plated brass leaf charms which will match my earrings. I have butterfly earrings too. The Lucky Clover Lariat looks very nice!